As I have mentioned before, William Haines Lytle deserves to have his shell pyramid restored. This pyramid marks the (approximate) location where Lytle was fatally wounded during the fighting on September 20. This first injury occured at the foot of what is now called Lytle Hill, behind the 24th Wisconsin. As his brigade began to give way on the left, however, Lytle rode up the hill towards the 36th and 88th Illinois, hoping to rally them and bring them back into the fight. Reaching the 36th, Lytle halted near the colors. “He drew his sword…and was apparently about to give orders to charge, when he was struck in the head with a bullet.” “He had just turned to give me an order,” wrote Lieutenant Howard Greene of the 24th, who was also serving as an aide that day. Greene was close by the General’s side “when the ball struck him in the mouth, passing through his head and coming out near his eye.” Greene slid from his saddle in time to catch Lytle, toppling from his mount, “by the head and shoulders…his blood spurting all over me.” The General wasn’t quite dead, but he was the next thing to it. Blood choked his mouth, and he was unable to speak. Both Greene’s and Lytle’s mounts, freed from their riders, bolted away. A cluster of aides now rushed to help, and they moved Lytle a short distance to the rear. By now, the entire brigade was collapsing and the party was in danger of being overrun, but moving Lytle much farther would only kill him. Greene recalled that Colonel Thomas J. Harrrison now appeared on the scene. Harrison commanded the 39th Indiana Mounted Infantry, the quasi-independent regiment who had supplied so much needed water the night before. Harrison’s men were to Lytle’s right, south of the hill, and Harrison was seeking instructions on where he could best help. Seeing the stricken general, Harrison lent a hand, urging the others to “carry him, or we will be taken prisoner.”. Just then Lytle convulsed in what Greene interpreted as his death spasm: “he gave me one embrace,” mourned the Milwaukeean, and then “his limbs immediately relaxed, his eyes rolled up into his head, and he fell over limp and lifeless.” With little choice, Harrison and Greene abandoned Lytle’s body. Harrison’s effort to move Lytle was not the last. Somewhere on the side of the hill, Colonel McCreery of the 21st Michigan stumbled over the fallen officer, and he tried to organize an evacuation also. McCreery recounted finding the badly wounded General still conscious. Lytle was still coherent enough to wave McCreery away, but McCreery insisted, collecting several men of the 21st and 24th to help him carry Lytle off the field. They managed four paces. Then a shell burst nearby, with fragments killing one man outright, shattering a second’s leg, and thudding into the Colonel’s shoulder. The survivors bolted, leaving both Lytle and McCreery to their fates. McCreery would survive to be captured, and escape from Libby Prison the next spring, along with Colonel Rose of the 77th Pennsylvania. Lytle would not. 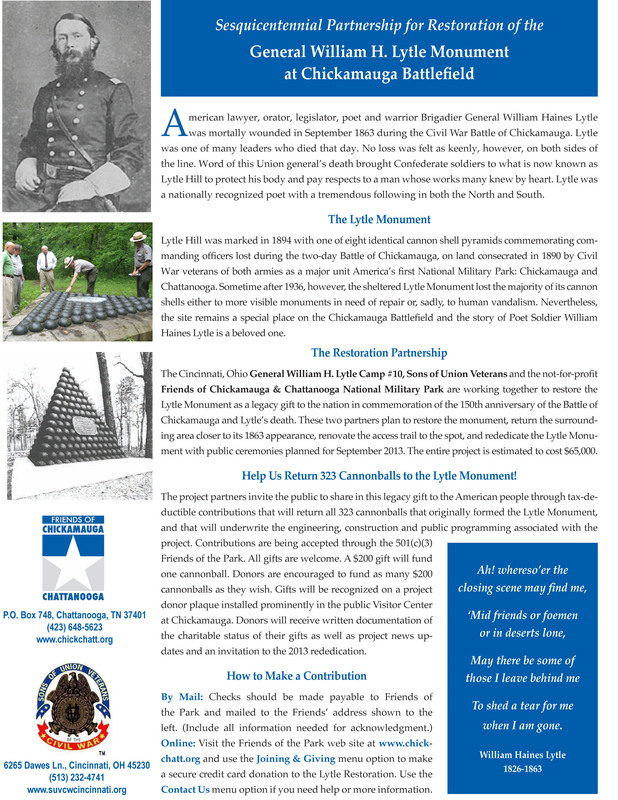 Lytle was widely recognized by the Confederates, and his body would be guarded until it could be moved to Hindman’s Divisional field hospital, near Dalton Ford. Lytle would be buried there, but only for about a week. His remains would later be reclaimed under a flag of truce, and he would lay in state under an evergreen bedecked awning amidst the camp of his old regiment, the 10th Ohio, until such time as they could ship his body back to Cincinnati. Over the years, the park has cannibalized his pyramid to fix other, more visible shell pyramids. Now, they have the means to restore the pyramid to how it should be. Lytle deserves his shells back. Please help.